Jan 20 '07 FLASH ANIME!---CLICK ON THE SUN. Jan 17 '07 LOVE CARDS FOR YOU! You can get these cards at COURAGE MY LOVE, Kensington in Toronto. *Click on the small image to enlarge it. 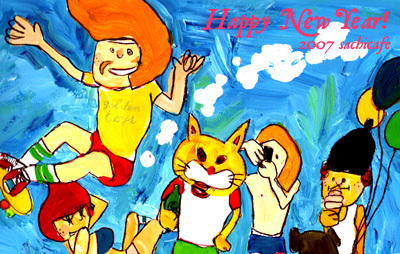 Jan 1 '07 HAPPY NEW YEAR2007!! Dec 19 '06 FM802 DIGMEOUT ART CALENDAR 2007. 06/12/11 Chirstmas cards for you!